The cavachon, also known as bichalier, is a crossbreed between a Cavalier King Charles spaniel and a Bichon Frise. The coat of cavachons is soft and of medium length, and this breed is known to shed less than other canines. Regular brushing and hair clipping is essential for keeping the coat healthy and shiny. The grooming of a cavachon should include regular ear cleaning, because the dog is prone to ear infections. Dental hygiene should also be included in the daily routine, to prevent periodontal disease. Start the grooming session with a gentle massage to relax your pet. While performing the massage, check for flea bites. 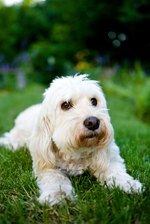 Cavachon dogs are particularly sensitive to flea bites, so you may notice skin irritation and swelling if fleas are present. Watch out for scratches or lumps under the skin. Brush your dog's fur with a soft brush to eliminate the loose hair and prevent tangling. Start with the head. Perform the brushing two or three times per week or at least on a weekly basis. 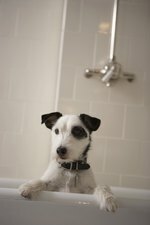 Brush your dog more frequently during shedding season. 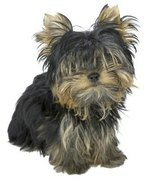 Use a metal comb if your pet has any tangles, and clip the matted fur that cannot be disentangled. Clip your dog's hair regularly. Use a pair of scissors or visit a professional groomer to style your pet's hair. Use canine nail clippers or guillotine-type trimmers to trim the cavachon's nails. The color of nails depends on the color of surrounding coat. In dogs with light colored coat, the quick is pink and can be distinguished from the rest of the nail. Cut just above the quick. In dark-coated pets, the quick is not visible, so cut several smaller pieces until you see an oval that is pink or gray on the surface of the nail you cut. Brush your dog's teeth daily to prevent early tooth decay and periodontal disease. Use a canine toothbrush and buy liver or meat-flavored toothpaste. Clean the dog's ears to prevent the excessive buildup of earwax and ear infections. Use an ear dropper and a saline solution. Insert a few drops of saline solution in the dog's ears and massage the ear area, allowing the dog to shake his head afterward.